"These oven-baked homemade doughnuts are sugar glazed then dusted with coconut flakes." Grease a 6-donut pan with coconut oil and preheat oven to 350 degrees F.
Sift together all the flour ingredients: rice, garbanzo, potato starch, arrowroot, baking powder, baking soda, xanthan gum and salt. Whisk together in a bowl and set aside. In a medium pot, add in milk and coconut oil and allow to warm over low heat until the coconut oil melts (do not allow to boil). Mix gently with a wooden spoon while it's warming. Once the coconut oil is melted, remove from heat and add in the sugar. Stir together to allow the sugar to dissolve completely. Add in apple sauce and vanilla extract and stir to combine. Add in coconut flakes and mix with a wooden spoon to combine. Pour into pre-greased donut pan and fill about halfway to allow for rising of the batter. Bake for 15 minutes at 350 degrees F. Remove from the oven and allow to cool 15 to 30 minutes. Gently scrape the sides of each well and flip the pan over to remove. You can use a toothpick to help the donuts lift out of the pan. 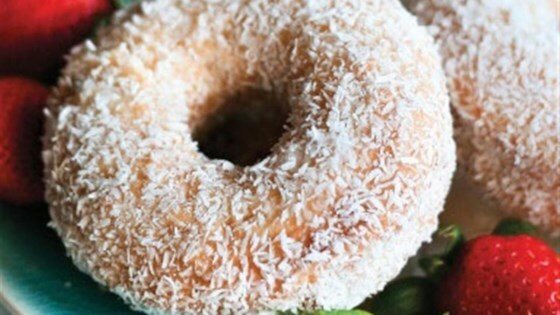 To coat the donuts in coconut flakes: Make a glaze by adding the powdered sugar into a small bowl and adding in 1 tablespoon at a time of hot water. Mix well to combine. Coat the donuts thinly with the glaze and drop onto a plate with coconut flakes to coat all over. Makes 6-8 donuts.